There’s nothing wrong with a little bit of grease! Super Duper Burger has a few locations throughout SF proper. We ended up at the Market Street location, near the border of the financial district/SOMA. I figure SD would be a good place for dinner, as it had come recommended by a friend a few weeks prior. We actually sat outside, right on Market, which was pretty fun, and quite nice in the late October evening breeze. It’s far enough from the sketchy neighborhoods where sitting outside is actually a nice change. I ordered a burger with grilled onions. Also garlic fries, because, well, garlic fries. For an almost-hipster San Francisco joint, being served a loosely-formed slightly greasy diner burger was a great surprise. Wait, slow down here…a diner burger? What on earth do you mean? Obviously, Super Duper is not doing my arteries a favor, but that diner burger always satisfies my taste buds. It’s not a huge burger, but it’s rich, so I found myself fuller than I thought I’d be upon first looking at the burger. Restaurants could take a page from the SD book – the diner burger is an art form. Does Super Duper have a clue what I’m talking about when I describe the style of burger they make so specifically? Who knows. But in my repertoire, there’s a place for a juicy, slightly salty burger such as this one. 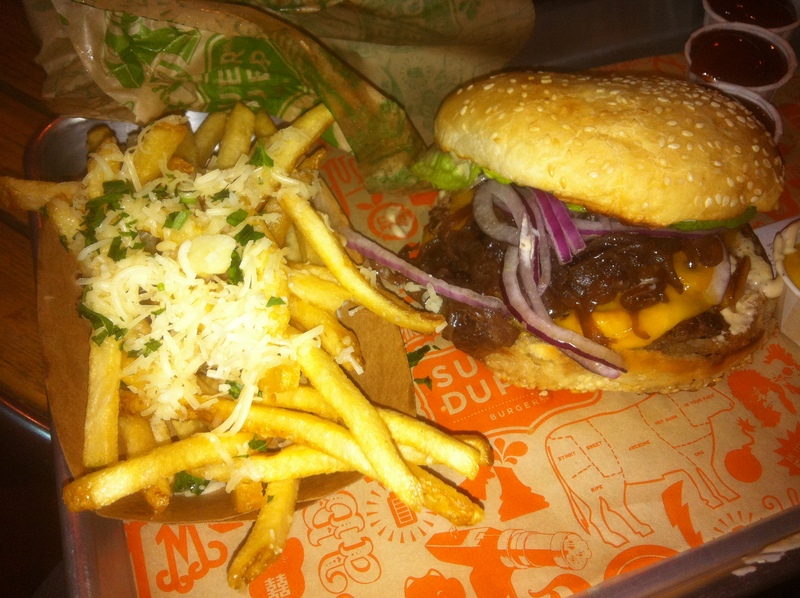 If you like that diner kind of burger, you’ll like Super Duper. Garlic fries were a nice accompaniment to the main meal. Noah ordered a milkshake, but it was a big disappointment. Extremely overpriced for a single glass of milkshake with no refill tin. Glad I skipped on that overpriced item. I do want to return here!